Sleek and effective, our 8.5 inch kunai knife set is not only practical and easy to carry, it is THE traditional multi-function ninja weapon. Whether you're throwing them or using them as a close quarters melee weapon, you won't find a more versatile knife! Constructed of 440 stainless steel, extremely sharp, center balanced and tight cord wrapped handle -- there is no job too perilous for these guys. Simple in design the Kunai was a staple to ninjas for many reasons, and you too will discover the same dependability in our Kunai knives. Set of 2 knives, 8.5 in. 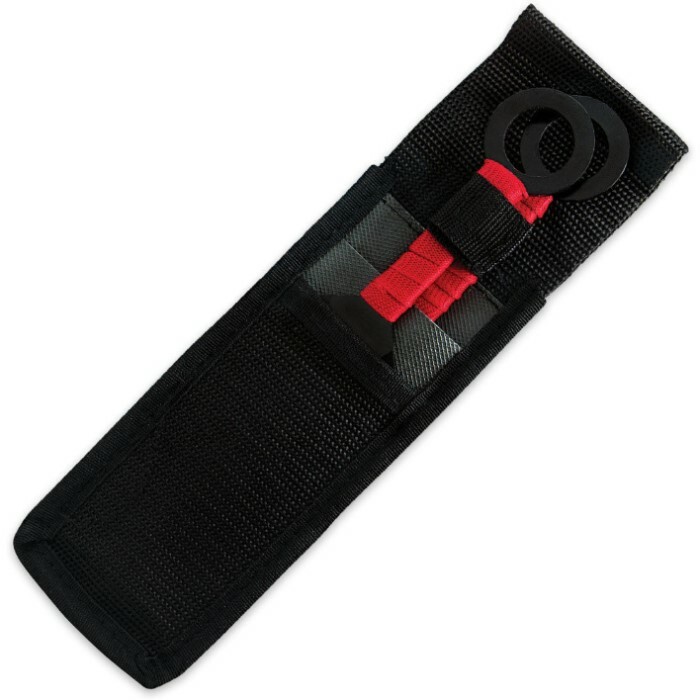 overall, designed for throwing and push dagger use, include nylon sheath with belt loop. From Ancient Japan to the Anime and video games of the present, Kunai knives have remained a trusted weapon choice for ninjas. A kunai is an ancient kind of trowel, originated during the Tensho Era in Japan. The kunai was normally wrought of iron, not steel, cheaply forged and unpolished. The size of most kunai ranged from 20 cm to 60 cm, with the average at 40 cm. The kunai was used by common folk as multi-purpose gardening tools and by workers of stone and masonry. The kunai is not a knife, but something more akin to a wrecking bar. The blade was soft iron and unsharpened because the edges were used to smash plaster and wood, to dig holes and to pry. Normally only the tip would have been sharpened. The uses to which a kunai was put would have destroyed any heat-treated and sharpened tool like a knife. Kunai normally had a leaf-shaped blade and a handle with a ring on the pommel for attaching a rope. 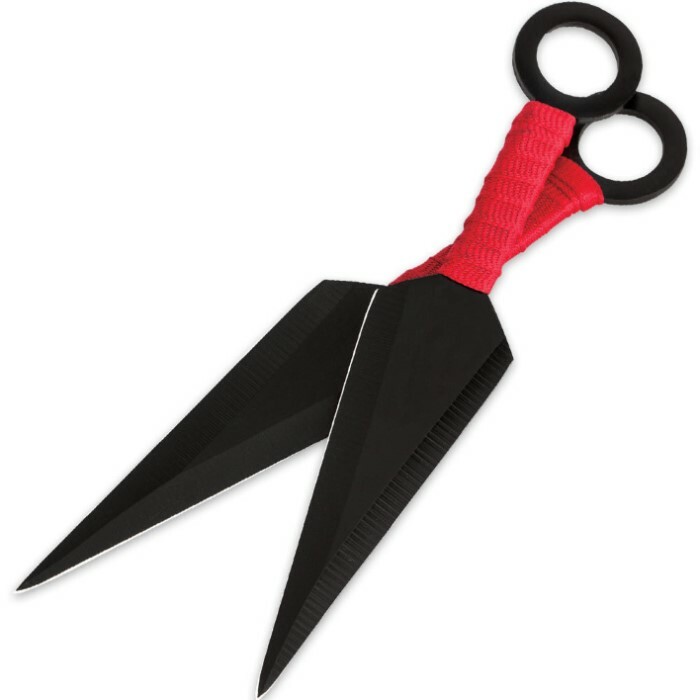 This would allow the kunai's handle to be wrapped to act as a grip, or when used as a weapon; to be strapped to a stick as an expedient spear, to be tied to the body for concealment, or to use as an anchor or piton. I purchased some about a month ago, and they've taken a lot of abuse and are still in fairly good condition, just a small chip on one and a couple scratches on the other. My only complaint is the wrap on the handles. It's not wrapped very well, and it falls apart. I reccomend unwrapping and redoing it yourself (also use super or gorilla glue). having alot of fun with these kunai they are exactly what i expected. Just received in the mail and as soon as I pulled them out of the box, I was in love. They're are a bit smaller than expected but that doesn't make them any less amazing. Plenty sharp and in perfect condition. I haven't tried throwing them to see how durable they are yet, but I did not buy them for that purpose so I won't be bothered if they don't throw well. I understand that these are advertised as throwing knives but in my honest opinion, I feel like these would do plenty damage if thrown. 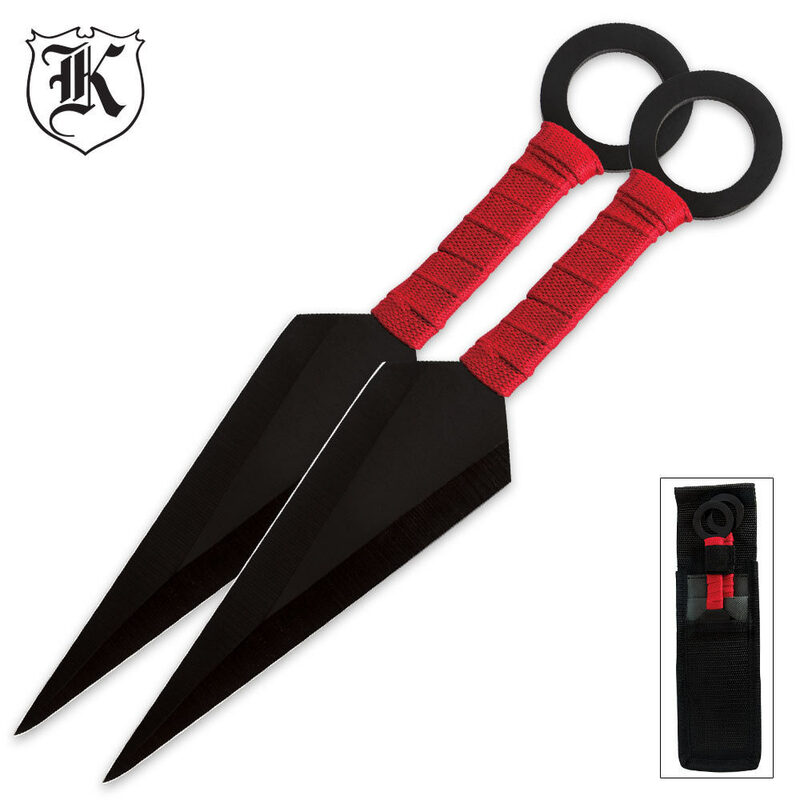 Theese kunai are awesome, good size, weight, balance, and easy to throw. Great for the price! got mine 4 days after i ordered them because it was friday when i ordered and got them on tuesday but they do feel nice when you swing them on your finger good price for the steal though. if you throw pretty hard because i do watch out because if you miss and hit the ground the tips will bend easy. LOVE PEACE AND HAIR GREASE Truesword readers. this product came in a timely manner. and i was satisfied with dealing with the website. the knives were great. the only reason i am giving 4 out of 5 is because of a mix up which caused me to receive the wrong size. but they fixed the mix up very fast.